Volunteers with the Unanimous Jury Coalition call registered voters to tell them about Constitutional Amendment 2. 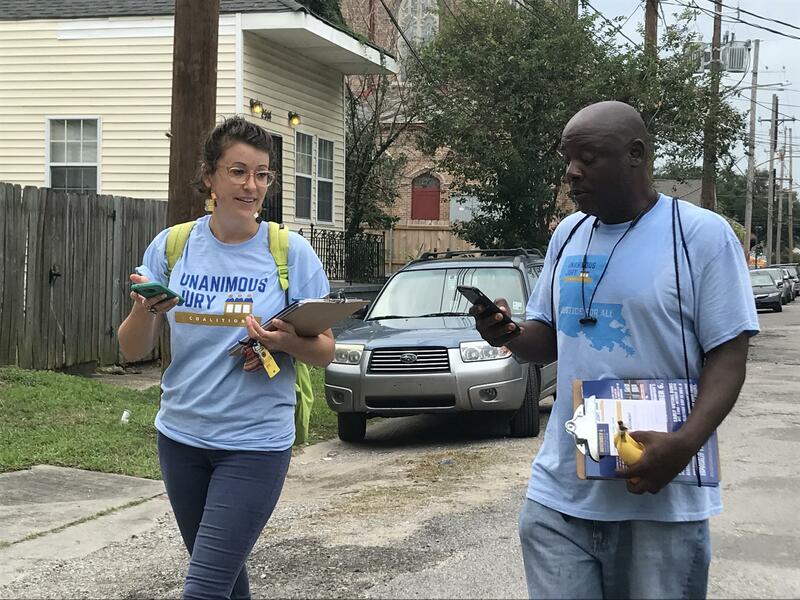 Unanimous Jury Coalition volunteers head out to knock on doors and talk to voters in Metairie. Once considered a long shot, the bill to approve a ballot initiative that could overturn Louisiana’s non-unanimous jury rule passed the legislature in May. The proposal needs a simple majority of voters to become law - but proponents of the measure face two challenges: educating voters, and breaching a partisan political divide. Wallis Watkins explains the outreach strategy aimed at educating voters about Constitutional Amendment 2. It was late August when Norris Henderson told a crowd of about one hundred elected officials, attorneys and community organizers in Lafayette, "We’ve got one shot and one opportunity - November 6th we have to take it." Henderson is the founder and executive director of Voice of the Experienced, a group that advocates for the rights of formerly incarcerated people. This night, he was rallying support for an upcoming ballot initiative that could require unanimous jury verdicts for felony convictions in Louisiana - a rule that 48 other states already follow. "We have to take this opportunity to change Louisiana, to stop us from being this outlier," Henderson said. Henderson is leading a statewide coalition of more than a dozen groups representing the left, right and center of the political spectrum. While their politics differ, they all support overturning a Louisiana law that allows a jury to convict someone of a serious felony, so long as 10 of the 12 jurors agree. The rule that dates back to the beginning of racial segregation laws in the south. But Henderson says there’s more to it. "Some people will hear this truth and think it’s just about black and white," he says. "But that’s just the ugly history of it." Henderson speaks from experience - he spent nearly 28 years in jail on a 10-2 verdict. "So 2 people didn’t believe that I should have went to prison," Henderson said. "And being 19 years old, I’m looking at the lawyer trying to figure out what happened." At his own trial, he didn’t know that he could be convicted with a non-unanimous verdict. "There are people in every audience who didn’t know that non-unanimous juries were a thing in Louisiana," says Thomas Aiello, an historian and author at Georgia’s Valdosta State University. 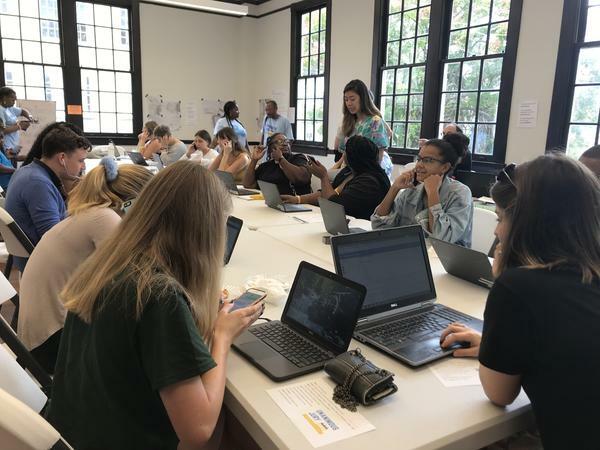 He traveled around the state this month, holding events on college campuses about Louisiana’s current '10-2' law, and its roots in the post-civil war south. "None of Louisiana’s former confederate counterparts adopted a non-unanimous criminal jury provision," Aiello says. "Louisiana was the only state among them to change it’s criminal jury standard." Ballot initiatives like this one don’t tend to get the same attention from voters as the candidates running for office. And midterm elections like the one in November typically see low voter turnout. So the coalition of supporters has put together outreach events across the state - phone banks, canvassing door to door, town halls and happy hours - to educate voters. But what about the messaging? Senator J.P. Morrell (D-New Orleans) authored the bill in the state legislature to get the amendment on the ballot. He knew from the beginning that the story of the law’s origins wouldn’t necessarily resonate with all voters across the state. "We haven’t shied away from the racist-basis, but when you make that the sole reason to do it, you lose people in that - if they don’t have a background where they’ve experienced it or they acknowledge it or they understand it, you lose people," Morrell says. Instead, Morrell highlights what he calls the laws constitutional problem - the idea that a person’s right to due process is threatened by allowing non-unanimous juries. "Whether you’re talking to a liberal-urbanite from New Orleans, or you’re talking to a say, someone from a more conservative rural area - there’s a line that runs through all of them which is an inherent distrust of government," Morrell says. "That argument brings everyone to the same tent." The constitutional argument got the support of conservatives, including the Louisiana Republican Judiciary PAC. An ad paid for by the group features State Representative Blake Miguez, who says it should be really difficult for the government to take away someone’s rights. "Here in Louisiana, we don’t take our rights for granted," the ad says. "And no jury of our peers should be able to take away these rights from any of us if there’s reasonable doubt. That means they should be 100% unanimous. We can’t take any chances when the government takes rights away." While there is broad bipartisan support for the amendment, not everyone backs the proposal. Opposition hasn’t been as vocal, but a number of district attorney’s across the state say the current jury system works - and requiring unanimous juries could result in more mistrials that bog down the courts with cases that have to be re-litigated. On November 6th, it’ll be up to a simple majority of Louisiana voters to decide.